Just about every tourist in Japan knows about the ever popular JR Pass. This fantastic ticket is arguably the best ticket for traveling around Japan. Unfortunately, if you are a going to be in Japan for more than 6 months, or are a Japanese citizen, the JR Pass is out of your reach. So, what kind of tickets are out there for foreign residents to use for traveling around Japan? The answer is the JR 18 Kippu. What is the 18 Kippu? Formally known as the JR Seishun 18 Kippu, this ticket is available every year for 11,850 yen. The 18 Kippu gets you 5 trips anywhere on the JR lines all over Japan! This boils down to only 2,370 per trip, an amazing deal! 18 Kippu: seishun means adolescent or young, but anyone can buy these tickets. This ticket is very popular among Japanese people, especially college kids who don’t have much money. However, don’t worry they never sell out. You can purchase the 18 Kippu at the Midori no Madoguchi ticket counter in most train stations. You will have to exercise your Japanese skills and ask the station attendant for the ticket, but it’s not that hard. Just say “Juuhachi kippu onegaishimasu” and you are set. In larger stations they have automated Midori no Madoguchi counters. We discovered that you can only buy a 18 kippu from the Japanese language menu options. They will not show on the English menu. 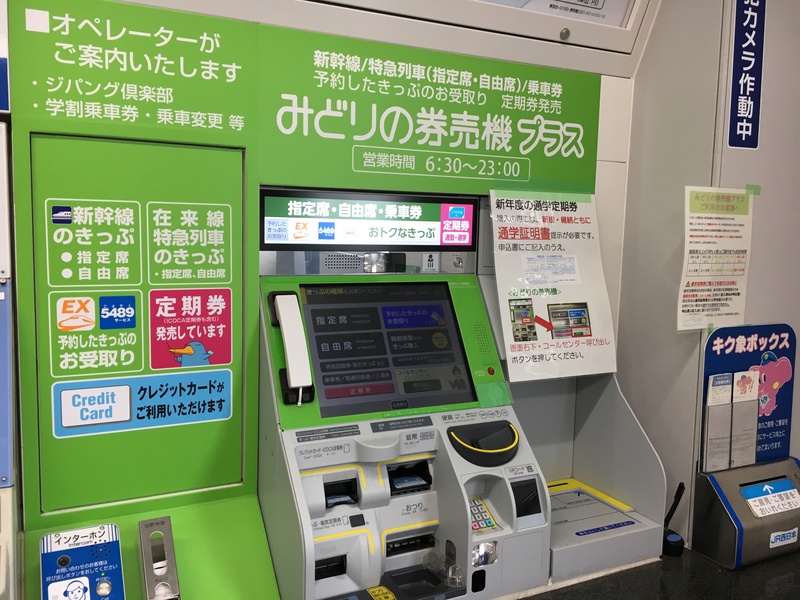 Additionally, some very small stations do not have a Midori no Madoguchi, so you will be unable to buy them at those locations. The 18 Kippu is truly a fantastic way to travel around Japan, but there are several limitation and rules you should definitely know before using it. Here are the most important ones. The 18 Kippu is only sold for a month in spring, summer and winter. In fall, there is the Testudo no Hi Kippu (literally meaning, train day ticket), which works much like 18 Kippu. Either way, you must use your ticket within the specified amount of time. The ticket is non-refundable, even if you do not use all your trips on the ticket. The 18 Kippu is only available on JR Lines. It does not work on private rail lines or subways. This limitation also excludes the formerly JR owned local private line, the Dai 3 Sector Line. The local private lines around Osaka include the Chizu Express Line and the Kitakinki Tango Railway. If you want to use either of these lines you have to pay the full fare. One of the perks about the 18 Kippu is that you can share the ticket. Unlike the JR Pass requires identification just for one person to use, more than one person can use the 18 Kippu. For example, two people can use the same ticket for the exact same trip. To do this, simply confirm with the attendant at the manned ticket gate the number of people traveling together. They will then stamp the ticket twice (one for each passenger) and the pair of you will be on your way. Alternatively, one person could use the ticket for a one way trip and then pass it on to another person and so on, until all trips are used gone. Each day you use the 18 Kippu, the ticket is valid from the time the first JR train runs until midnight. Although some trains will still have service until just after midnight, the ticket does not cover this additional time. Not Available for Limited Express or Shinkansen. You can only use the 18 Kippu on the local, rapid and new rapid service trains lines. Of course, this means you cannot ride the Shinkansen either. It would be nice if the ticket covered the limited express and Shinkansen like the JR pass, but unfortunately it does not. If you wish to ride a limited express train, you must pay the entire fare plus the limited express fee. The rules about riding in the premium cars, such as the green cars (Tokyo) and the A-seat (Kansai), are a bit complicated. The 18 Kippu will cover your train fare if you ride in the non-reserved green car (you still need to pay the green card fare though), but it will not cover a ride in the reserved green car. This restriction isn’t so bad because this means you can use the 18 Kippu to ride the green cars on the local trains in the Tokyo area. Similarly, in the Kansai region the 18 Kippu will cover you train fare for a spot in the A-seat special rapid service, though you still need to pay an additional fee for you seat. Another great point about the 18 Kippu is that you can freely exit the gate as many times as you need to, something many Japanese tickets prohibit. For most tickets, once you enter the gate you cannot exit it again. However, the 18 Kippu lets you exit the gate as many times you want. All you need to do is present your ticket at the manned gate. If you aren’t totally sure where you are going this is a real lifesaver because you won’t get stuck on the wrong platform! While people often praise Japanese the train system for its punctuality, they are actually riddled with short delays, especially in busy cities like Tokyo. Though brief, these delays can be really bad because you may miss your transfer train, which might force you to cancel your trip simply because you cannot reach your destination. If this happens to you JR will not give you refund. If you really want to make sure you are on time, buy a jikokuhyo [時刻表] before you go on a trip!! A jikokuhyo is essentially a book of all train schedules in Japan. Two major companies sell versions of the jikokuhyo: the JTB jikokuhyo and the JR jikokuhyo. These books can be large, but they also come in a smaller size too. Each book contains the exact same information, so it doesn’t matter which one you buy. 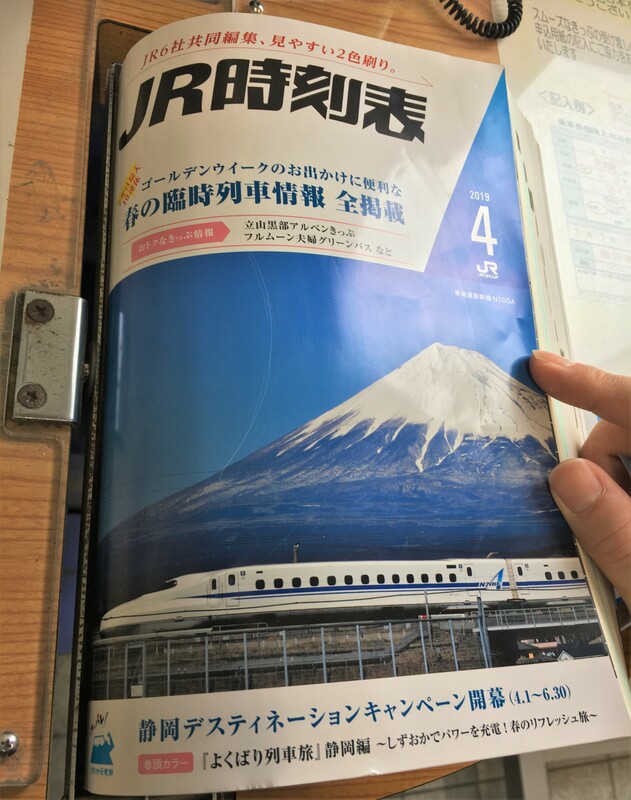 A jikokuhyo contains timetables of all JR lines, some of the limited express of private lines, all airline services, highway buses and even includes what kind of bento is available in major stations! Jikokuhyo are also available in a number of train stations throughout Japan. If you want your own copy, pocket versions usually run about 500 yen. Buying a jikokuhyo and learning how to read it might seem like a giant hassle, but it is the better option for those who really want to have total control of their trip. Of course, there are websites where you can input your destination and they will outline all the trains you should take as well as the times. While this service seems like the most convenient, one draw back is that these websites will more than likely put you on major rail lines. At first glance this might not seem bad, but these lines can be very crowded at times, as they will more likely run through major cities. Seeing nothing but houses after houses can get dull and it might be a long time before you are able to get a seat if it is packed. However, it doesn’t have to be this way. Since the 18 Kippu lets you ride whatever lines you want that means you can take the smaller lines that run through the Japanese countryside. These smaller trains are rarely crowded and sometimes the trains have special designs or themes. This line will take you through Sanin’s beautiful countryside on quaint diesel trains. This route will also take you over Japan’s tallest train bridge, the Amarube Bridge in north Kansai. While most people take the Tokaido Line from Osaka to Tokyo, I recommend the Chuo line. After Nakatsugawa Station, you will the magestic Japan Alps on either side of your train. South of hte Kansai region is the Kii Peninsula. The smaller rail line here will run on narrow rails between the beautiful ocean and mountains.